Heather and Alec are truly a beautiful couple. I have known Heather for a few years from working at Disney together and I remember when her an Alec just started dating. They are so incredibly perfect for each other and it was such a heartwarming experience to not only see them become husband and wife, but to create custom pieces for their wedding day. When I first met with Heather to discuss the details of her big day, she had stated that their vision for the wedding was classic, elegant and romantic. 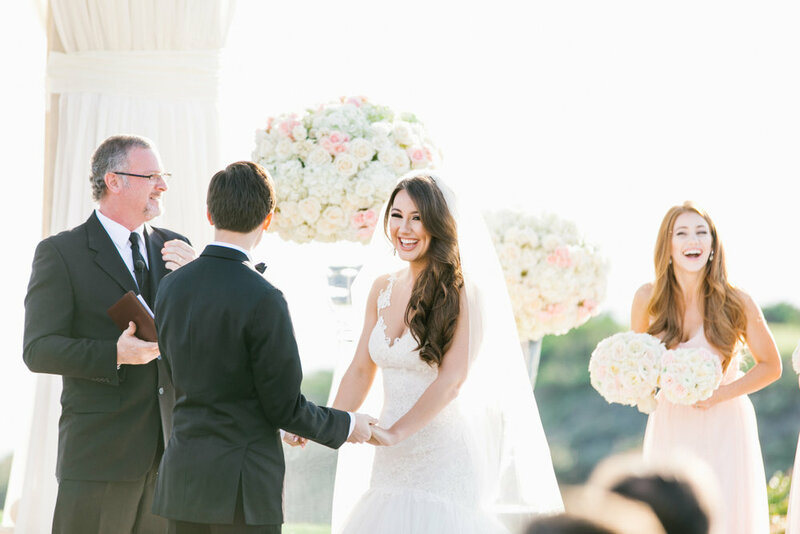 She asked me to create day of details that would compliment their wedding theme and add unique touches to the gorgeous venue, Pelican Hill Resort in Newport Beach. I started by designing their invitations using metallic gold foil with a custom border and elegant black letterpress. I also created a floral envelope liner (for those of you who know Heather, it was her little nod to Disney!) and assembled them each with a blush bellyband and gold custom wax seal to tie it all together. One of my favorite pieces was the custom watercolor map I made for them with also tied in some of their blush tones throughout the wedding. Along with the invitation suites, I designed programs and menus also using gold foil and black letterpress with a wax seal touch on the tops of all the menus. They chose two kinds of table numbers - some round mirrors and another kind that had photos of how old they were at each age. It was one of my favorite personal touches! The gold foil bar menus, cocktail napkins, signage and hand written quotes were also some beautiful details that made the day extra special. I also made a mirror welcome sign and seating chart and some of my favorite place cards for them, the marble tiles with gold ink. Another fun touch was the custom snapchat filter! It was such an incredible feeling seeing all of these details pulled together the day of the wedding. Not only did I get to attend the wedding for two close friends, but I got to create magical pieces for them to enjoy and look back on forever.